Many thanks for your time earlier this week and I understand where you are coming from with your interest in going to Everest. On a personal note, however, I am concerned about your lack of experience and, as a result of that, would feel uncomfortable about you being with my group. I know that you plan on going on a climbing course in January but I only recruit people who are already climbers and mountaineers, and have been for some time, and are therefore suitably well qualified by experience. It is only with years of experience that things become second nature. I know that you feel that you may pick up all the skills very quickly but the mountain demands a lot of respect. If the conditions take a turn for the worse, or if your Climbing Sherpa were to become incapacitated, then you may find yourself on your own and need to be wholly reliant on your own ability to deal with steep terrain in a potentially very demanding and ever changing environment. I can’t have a situation where more experienced climbers, or my Climbing Sherpas, have their lives, or their summit bid, jeopardised as a result of a very inexperienced member in the group. It is an all inclusive trip and is already very competitively priced. There are a couple of operators out there who are similarly priced, or slightly cheaper, but generally they don’t provide as comprehensive a package. Anyway perhaps they will be open to negotiation – but I’m afraid that I am not. So come on folks … am I being too harsh here? Any thoughts? The worrying aspect is that ‘I’m good in the gym’ and ‘I can learn skills really quickly’ just doesn’t cut the mustard with me. 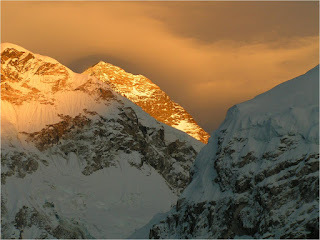 I find it worrying that some people are completely naive and feel that they can watch a programme, or read a book, and then ‘give it a go.’ Everest is too big and too serious to just come along and ‘give it a go.’ It demands a huge amount of respect and it is this approach that will be the undoing of people every year. And unfortunately that then tarnishes the reputation of Everest and undermines the achievement of the climbers and mountaineers out there who do approach it with the right background and mountaineering pedigree. ‘It’s been my lifelong ambition for the last 5 years.’ Well unless you are only 5 years old then that isn’t a lifelong ambition. And why haven’t you done something about it in the last 5 years then (which, with a bit of hard work and plenty of time on the hill, would possiby be long enough to get yourself suitably well trained by the way). I am all for people venturing in to the realms of ultra high altitude mountaineering – personally some of the most rewarding experiences that I have had have been on expeditions with like minded people. But start at the beginning and work your way up. I know that not everyone feels that they have the time, or money, to go on loads and loads of trips and work their way up through the ranks. But even so, don’t just dive in with Everest. UK hills, UK rock and UK (Scottish) winter all provide fantastic opportunities to further your skill level and be subjected to some ever changing and demanding conditions (as well as some fantastic memorable days out). If you can get to The Alps and maybe an expedition or two as well then this will be a bonus. But don’t turn up to Everest to ‘give it a go’ and be surprised when it spanks your arse. Not even in my wildest dreams did I ever think that this is where it was all potentially leading. I started out my outdoor career at a centre in Wensleydale and after 7 years I’d worked up to being Deputy to head of Centre and Senior Instructor. It was a great job at a small centre – I was out on session a lot but also responsible for staff training, the off duty, the group programmes, the fleet of vehicles, risk assessment etc. The boss wasn’t going to be moving on and eventually it was time to spread my wings. When I first arrived in Keswick I had 8 part time jobs – anything to pay the bills. At about the same time I was offered some work in Nepal and I jumped at the chance. It had never previously occurred to me that it was a possibility but I knew that it was an offer I couldn’t refuse. This then led on to me working for KE Adventure Travel who are based in Keswick, where I’d settled after the Yorkshire Dales. I’d sent in my cv and resume and followed it up with a phone call a week later. In the midst of being told that they were ‘very busy’, ‘lots of leaders already’ and ‘Keswick is a long way to come for a chat’ I mentioned that we had the same postcode. ‘Oh I’ll get the kettle on then, see you in 5 minutes.’ I was there in 3. It was great employment and I loved the culture and environment as much as the landscape and work. I’d lived in Cambodia for 6 months in a previous life and whilst I was there I’d had a quick whistle stop tour of Asia and been hooked. To be back in Asia and working in the mountains was just awesome. I’d often been asked ‘as a mountaineering instructor you must want to do Everest,’ which I’d never quite understood. Now that I was working a lot in The Khumbu I was now getting ‘as an expedition leader you must want to do Everest.’ The answer was always an emphatic, and honestly from the heart, ‘no thanks.’ I’d then go on to explain that it’s very cold up there, potentially pretty dangerous, very expensive, loss of income whilst away, potential loss of digits and life etc etc. And anyway, without the experience I’d never get employed and I definitely didn’t want to go along as a client – not that I wanted to go anyway. Not for me thanks. No siree. And I genuinely meant it too. My previous life had been as a commissioned officer in The Royal Corps of Transport and so I had a bit of an understanding of different types of leadership, motivation, delegation, logistics etc. I’d also been on the Arctic Warfare Instructors course which was a pretty challenging 8 weeks in Norway (one of only a few military courses where you are officially on double rations). Out of 35 on the course only 5 of us passed. I saw grown men in tears during the 8 weeks because of the cold, because of the knarly desperate conditions we were in (with pretty flimsy gear at times) or from trying to ski wearing planks of wood carrying 80Kg and because, at the end of the course, we then had to ski in to a hole in the frozen fjord and get ourselves out. It was all fairly brutal stuff really. I hadn’t realised at the time, but it was another pivotal experience for me. All this experience and training came in to play whenever I was on an expedition and I found it to be a remarkably fortuitous background – totally alien in many ways to being ‘a civvy,’ but leadership skills and an understanding of logistics are all so transferrable. As are the skills required to look after yourself, and still lead others, in the worst of conditions, even when you are at your lowest ebb. I’d been lucky enough to have a friend in Keswick ask me if I could put together an Ama Dablam trip and I jumped at the chance. It was a great trip – just a bunch of mates having a go at a very impressive mountain. No Climbing Sherpas or High Altitude Porters – just a cook crew, some porters to Base Camp and a Sirdar. We had a great laugh and it was then that I found out that I was also pretty good at altitude. Having put in all the effort to run that trip, I decided to advertise and I’ve been going back every year ever since. It’s amazing that people ask ‘don’t you get bored of climbing Ama Dablam every year?’ It’s the most amazing mountain in the heart of some pretty spectacular mountainous terrain where I get to see and work with Climbing Sherpas who have summited Cho Oyu, Shishapangma, Manaslu, and Everest (one chap 18 times) who are now family friends. I’ve been working with Kame, my Sirdar, for 9 years now and it’s a privilege to be with them every time. When I compare that with climbing Snowdon, The Ben or Mont Blanc a few times every season then I realise I have managed to manoeuvre myself in to a very privileged position. Sometimes you have to make your own luck I guess. In 2001 I heard about a bunch of mates who were off to have a go at Everest in a few years’ time. The approach was the old style of expeditioning – just a bunch of mates on the hill. I was sort of tempted because, although I knew I’d never have a go at Everest, I also knew that if I did have a go it would be in that style. However I already had another commitment – my own group on Island Peak and the 2 overlapped by at least fortnight. 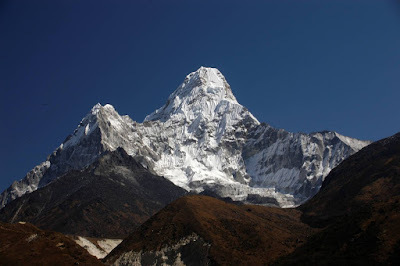 I was back from Ama Dablam (again) at the beginning of December 2004 and I was chatting to Matt Sharman about the forthcoming Everest expedition and he said he was arriving in Kathmandu on the 19thApril. My 3-years-in-the-planning-private-Island-Peak-group were departing KTM on the 18th April! I realised that, whilst the two trips overlapped by a few weeks, that in actual fact it was a possibility after all and this was one of those once in a lifetime opportunities. I made some hasty phone calls – one in particular to a chap called Baz Roberts. I’d just been on his Wilderness Medical Training course (very highly recommended by the way) and he’d shown us all some Everest video and photos from his trip with Russell Bryce on the North side that Spring (2004). He had wanted to go on the hill from the age of 9 or so, and everything had been leading up to that experience. He’s a very methodical guy and even though I didn’t really know him at the time I rang and asked him a bunch of questions. He advised that I ask my friends about our relationship with Russell Bryce (Tom Richardson and Ian Wade both knew him), how much oxygen we had (enough), our Base Camp support (Mick had a friend who was a doctor (another +ve) who had researched the 1996 disaster and written a paper on high altitude meteorology (perfect)), what comms did we have (Ross was ex forces and had some friends who were lending us a VHF set) etc etc. The guys had been planning this for 3 or 4 years and absolutely everything was in place. Not only were we the smallest, cheapest trip on the mountain but also the most experienced. Ian Wade, perhaps the most prolific of the lot, had summited over 65 6,000m peaks as well as Cho Oyu and Gasherbrum II – both without oxygen. Tom Richardson had done more than most people will ever do in their lifetime. Ross, Dan, Mick and Matt were all full time, or certainly far more than part time, expedition leaders and Stuart Holmes … well very bright light under very large bushel springs to mind. I was to be in the company of some of the nicest (and most experienced) guys I could ever hope to be with and my wife knew most of them too. So whilst Ali (and I) found out on Boxing Day 2004 that ‘it’s turned blue!’ and I was going to be a daddy, she still gave me her blessing to go on the trip. I signed up at the end of December and was going away in March. I started eating pies and doughnuts and, despite working every day in Scotland that winter, managed to put on 2½ stone. It’s the hardest training I have ever done. These guys had invited along (only) 4 Climbing Sherpas who were their friends – 2 of whom I already knew having worked with them previously. So it wasn’t climber and guide or employer / employee – it was a bunch of guys (and their Sherpa friends) on a BIG mountain. It was a low key, low budget, but highly professional effort and, considering not a crossed word was said for the whole trip, was a roaring success. I went along just thinking that I’d see how it went. I had no aspirations for the summit (having only been to 6,856m previously) and just approached each day as a new day and a new challenge. After a while it was obvious that we were all having a great, fun time and that we were all so much at home in the harsh environment that is the North side of Everest and I honestly thought that we would have 6 or 7 (if not all 8) out of the 8 westerners on the summit. As it happens things conspired against a few of the guys towards the end of the trip and before you know it there were only 3 of us on the top. But all 4 Climbing Sherpas also summited which was superb. 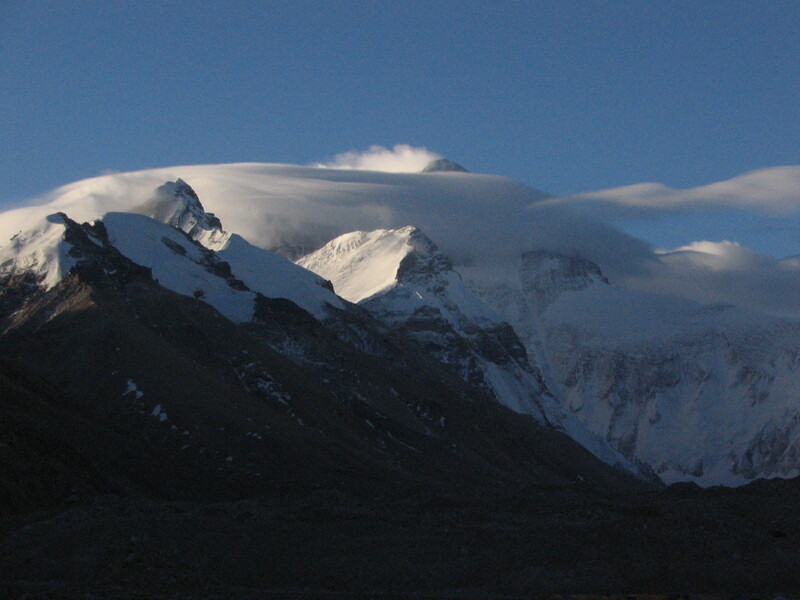 Phendan had been on the top before but the others Sherpas hadn’t. They had all worked so hard and Zambu, for example, had carried loads to the top camp 11 times. On the North side the top camp is at 8,300m (so 99m higher than the summit of Cho Oyu) so this is an amazing feat and we couldn’t have done it without them. Thankfully it has opened a door for all of them and they are regularly employed on Everest (or Cho Oyu / Manaslu) and have managed to break away from the trekking peak trips that they so often did. I knew that if I had the chance that I’d love to go back. But I also knew that I wouldn’t go back on the North side. It’s a particularly serious summit day and if a client got in to difficulty then you may as well get out your rosary beads. Also it’s the Climbing Sherpas who generally get involved with rescues and I didn’t want to have the onus of endangering their lives, let alone those of any clients, even more so now that I knew them all so well. A few Ama Dablam trips and a Cho Oyu trip later and an opportunity arose. I was asked to lead a group to Everest Base Camp for a chap who would then stay on Everest. I mentioned that I may know of a few people who would also like to have a go at Everest. ‘You’ve got the job.’ I cherry picked from my database and e mailed 23 people who I thought had not only the aspiration and experience but also the right approach and temperament as well as the ability to afford it and get time off work. 12 were interested. That soon dropped to 7 or 8 and then the credit crunch happened. We were down to 3 so we delayed a year and eventually, in April 2011, myself, a friend of mine who was to be our Base Camp doctor and 5 hopefuls started trekking. Rather than racing up to EBC, sitting there for a fortnight with headaches wondering how we would ever climb Everest feeling like this down here, we trekked for 3 weeks elsewhere. It was a great acclimatisation schedule but it also allowed everyone to forget about work etc and to relax and enjoy the experience without having the overbearing nature of ‘Everest’ dauntingly in view. Whilst we would never get away from the fact that this was definitely an organised trip I wanted to try and recreate the style of expedition I’d been on in 2005. To that end I was very conscious of the fun factor and for everyone enjoy each other’s company. There was not a headache in sight for the whole trip and we arrived at Base Camp as a team, a unified dynamic group, rather than a bunch of clients. We were enjoying ourselves, and the environment, and the rapport was noticeable. I’ve seen other trips where the clients are so tense (and intense) that it is just no fun at all. Indeed you can see people calculating and trying to out manoeuvre each other in a dog eat dog slow race for the prized summit. They certainly don’t lift a finger for each other as they definitely don’t want to risk their own chances. My team went the extra mile for each other. When we were on the hill, whoever arrived first at a camp got a brew on and then, after admiring the view and getting their breath back, started sorting the tent, roll mats, sleeping bags etc for themselves and their tent partner. The sort of thing that comes naturally to experienced mountaineers who realise that synergy is so important. You don’t count the cost or take turns – it just happens. When we first entered The Khumbu Icefall it was quite an emotional experience. Suddenly we were in the steps of the great pioneers. We’d all read the books and it was all so historical and evocative. Everyone upped the ante and changed from fun trekking mode to fun expedition mode and it was noticeable that everyone just sharpened their senses. Looking up The Western Cwm with The Lhotse Face in the centre and The Geneva Spur the obvious rocky outcrop just left of centre leading diagonally off to the left and on up to The South Col.
A few forays up and down the hill through the icefall and up The Western Cwm and we were ready for our summit bid. In the old days folk used to camp higher and higher on the assumption that they were acclimatising. Nowadays we realise that round about 6,500m is the threshold and beyond there a) you don’t acclimatise and b) you just deteriorate. The weather was all over the place for a few days and indeed we arrived and slept at Camp 3 (7,100m) on the way to the summit only to have to come back down to C2. It wasn’t bad enough for long enough to warrant going to Base Camp so we stayed at C2 for 5 nights. 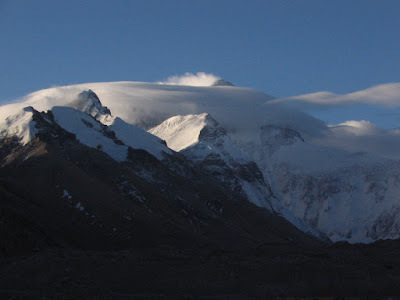 Then back to C3 and on up to The South Col. Again the wind spiked and we stayed at The South Col for 24 hours and then set off in to the night. Exciting stuff. The downside, however, was that not only had some other teams sat it out as well but others had then arrived the following day for their summit bid – so there were twice as many people as we’d have hoped. It turned out to be a fantastic moonlit night, but at times a painfully slow journey. There was a queue pretty much most of the way up to The Balcony. My feet got pretty cold and were getting colder due to inactivity. I pondered this for the interminable minutes standing still and couldn’t work out why. I had the same boots as 2005 when it had been colder and windier. I had smartwool liners and mountain socks, the same as last time. I had some foot warm up sachets and I’d checked thast they were working. Yes, we were going slowly, but why were my feet this cold? Ponder, ponder. The only reason I could come up with was that the liner socks were my wife’s and were too tight for me and were constricting circulation, albeit ever so slightly. So on arriving at The Balcony, when everyone else was changing cylinders or taking on fluids and food, I whipped my boots off, took off my mountain socks and removed my liners. They froze the instant I’d removed the inner boot and it was paramount that I get my big socks back on and my feet in to my boots before they froze as well. I’d been rehydrating along the way whilst waiting for folk to move so there was no other reason for me to stop. Within a couple of minutes I’d managed to sort my feet out and was on the move. I over took about 30 to 40 people who were still loitering and being tended to by their Climbing Sherpas. The rest of my group had sensibly moved straight through, as we had agreed previously in the event of any queues, as they could change cylinders later. Looking back down to The Balcony and some of the people we’d managed to zip past. I soon caught up with Jen and Susan who were going fine. We fragmented slightly around the South Summit, as I’d encouraged everyone to go at their own pace. Yes we were a strong, dynamic, closely bonded group – but not on summit day. You go for it with your Sherpa and don’t wait for the others – don’t jeopardise yourself. Maybe we’ll meet on the summit, maybe not. Giles had managed to get ahead of the crowds and summited at just after 5 in the morning and Partha summited at around 7.30. I’d seen them both as they were descending and they seemed to be suitably chuffed. Smiles and handshakes, a brief chat and then onwards. Ever so slowly. Onwards and upwards. I summited around 9.15. Jen and Susan and their Climbing Sherpas arrived whilst I was still on the summit – which is hardly surprising as I spent an hour and a half up there. It was a great day to be on the top again. Not too cold and no wind. The view was as spectacular as I remembered albeit spoilt slightly by the cloud that meant only the very highest peaks were visible. In 2005 my camera only had the facility to do 30 seconds of video but I managed to fit in a 360 panorama and we only stayed for maybe 15 minutes. This time I had unlimited video capacity and managed to get a slower more comprehensive video. I get a lot of comments from folk on YouTube about how good it is which is a great compliment. It was a fantastic culmination to a great expedition. Without a doubt it the best and most exciting work I have done. I enjoyed it so much that I’m going back again next year! Watch this space. 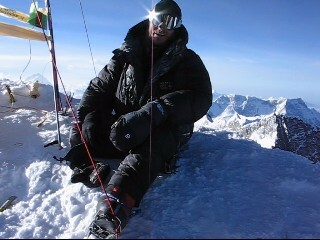 On the summit of Everest.